From Friday 25 January to Sunday 27 January, five students from Presentation College – Liam Bradley, Fiona Butler, Nikola Glowinska, Ciara Glynn and Natalia Sluzel, participated in the Leinster Regional session of the European Youth Parliament (EYP). 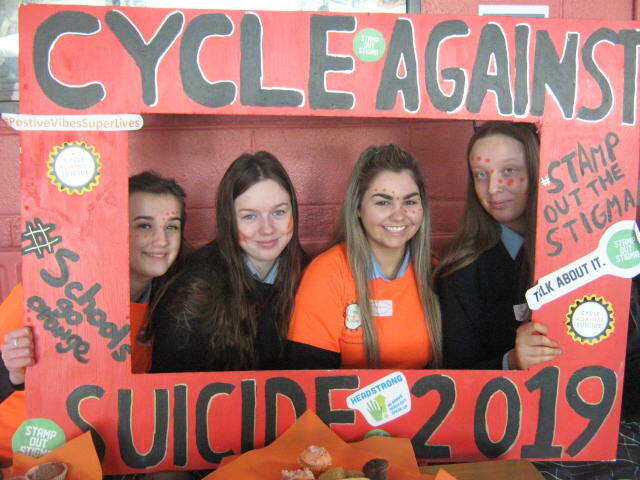 This was organised through their Guidance Counsellor Ms. Marie Cumiskey and took place in Dublin in Loreto Abbey Dalkey. Friday began with ice-breaking games with all the other participants, the organizers, chairpersons and members of the media. After that, students were divided into committees. They then engaged in more team-building exercises and energizers. There were also some inter-committee games to get participants more comfortable around each other. Following dinner, everyone went to the hostel for the night. The issue of maintaining Ireland and the UK’s trade imports after Brexit. The lack of legislation on drone warfare in the Middle East. The problem of growing obesity in the EU. The EU’s over-dependence on Russian gas. Students began with discussing the issues relating to their own topics. During that time, to help with perspective and to encourage new thinking, energizer games with students from different committees were played. Committees then came up with resolutions to the issues earlier identified and prepared their Resolutions Booklet. Later after dinner, students enjoyed a quiz with the members from all the other committees followed by a disco. On Sunday, the General Assembly took place. This consisted of all committees coming together to debate their topics and resolutions. Following an initial energizer, the debating began. Each committee was furnished with the resolutions of the opposing topics in order to prepare arguments and possible rebuttals to the speeches. Every debate lasted roughly forty-five minutes and every individual team involved themselves enthusiastically. Out of the eight topics, four topics – including the one proposed by Ciara and Natalia’s group were passed by majority vote. This was a great turn out for the General Assembly. 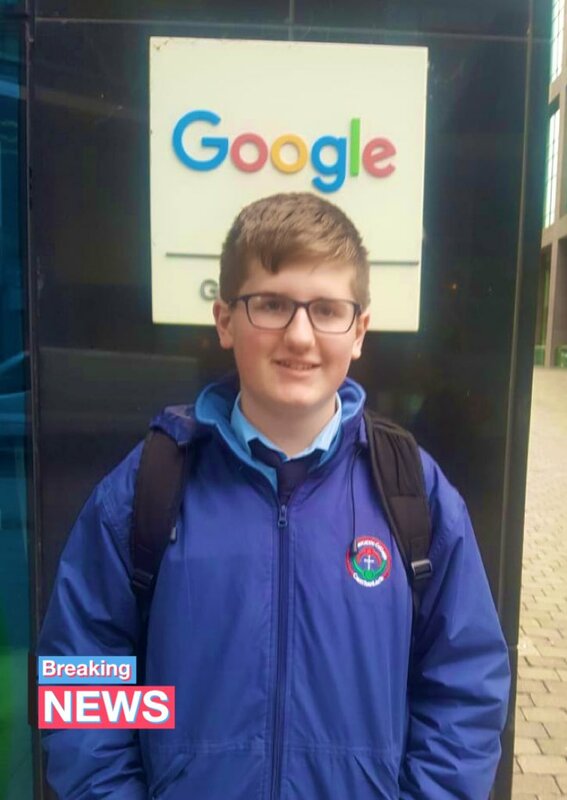 Following this, a ceremony was held in order to close The General Assembly and to say goodbye to a long-standing member of EYP Leinster – James Bradfield. The weekend concluded with everyone singing “Imagine” by John Lennon. This is an EYP tradition. 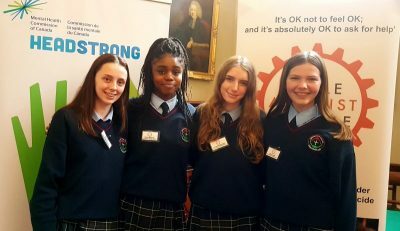 Liam, Fiona, Nikola, Ciara, and Natalia would like to thank Ms. Cumiskey for giving them the opportunity to meet new people, to consider and debate the issues facing Europe and come up with possible solutions to resolve the issues facing Europe today. The whole weekend was a fantastic experience. 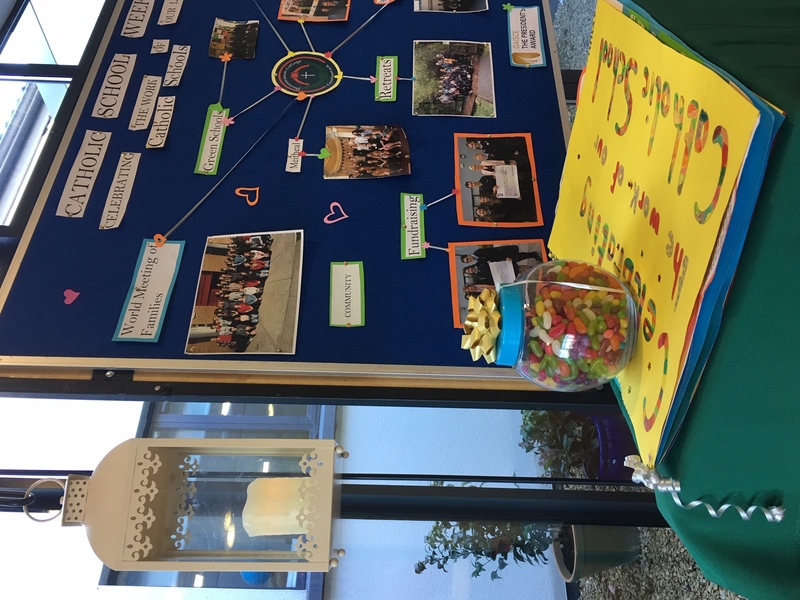 Last week Anne Dwyer gave a presentation on “Friends of Nano” to the teachers involved in The Faith and Ethos Team in the school. Anne is The Project Officer for Friends of Nano (Ireland). 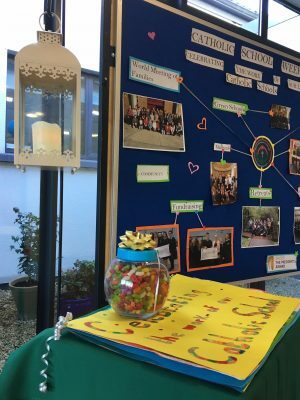 Friends of Nano, is a spirit-led initiative of The International Congregation of Presentation Sisters (Union) which celebrates and promotes the charism of Nano Nagle in new and creative ways. Anne can be seen in the photograph admiring The Nano Nagle Tapestry, which hangs in the Reception Area of the school. 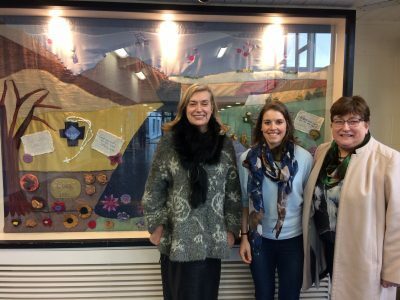 This beautiful tapestry depicts the story of Nano and the characteristic spirit of our school, which reflects the mission values of our founder Venerable Nano Nagle. 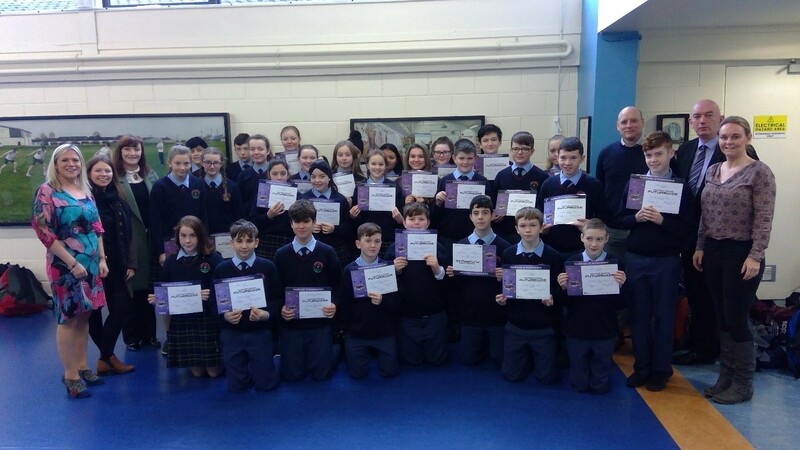 Congratulations to Mr. Delaney, Ms. Cardiff, Ms. Thornton and their team of students who braved the elements in the recent South East Athletics Competition. Orla Woods and Aibha Kiernan both qualified for the next round of the competition. Orla qualified for the minor girls and Aibha for the intermediate girls cross country section of the competition. Both girls now progress to the Leinsters. We wish them and their trainers the best of luck. Over the last few weeks, a herd of ‘Wellephants’ have found their home in Presentation College. 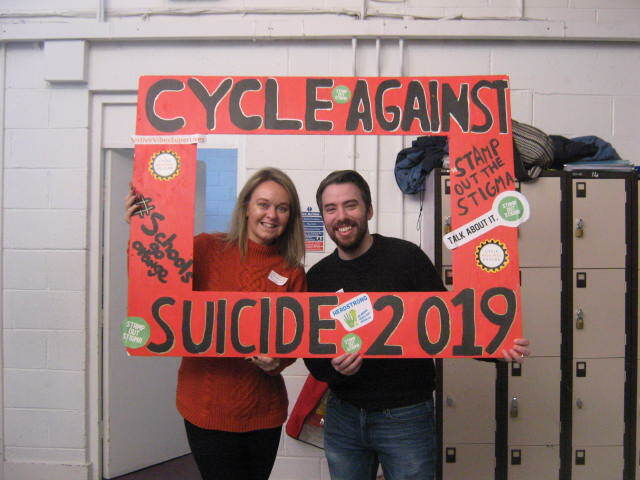 We promote Wellness in our school in many ways, through the support systems we have in place for students, (both personal and academic), the range of extra-curricular sports and activities, which we facilitate and the inclusive atmosphere, which we incorporate into our teaching. We believe that our mental health can be the ‘elephant in the room’, something which we very often do not speak about with our friends and family. In order to encourage people to start speaking out about their mental health we have decided to create the “Wellephant”. The “Wellephant” or Wellness Elephant, is a project undertaken by a range of students from S.P.H.E and Health Education to promote Wellness in our school. The students coloured and laminated many elephants and stuck them around the school, in every classroom and every common area. The purpose of the “Wellephants” is to encourage the students to talk if they are having a bad day. The idea is that they will see one, as they move from class to class and recognise it as a symbol of Wellness and be reminded that our mental health doesn’t have to be the ‘elephant in the room’, and they always have somebody with whom they can talk. 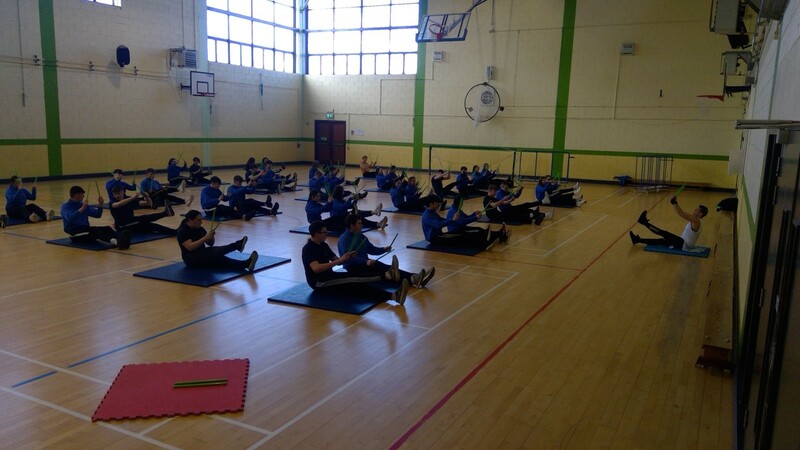 Over the last few weeks, Transition Year PE students have been lucky enough to experience a fun new fitness craze called POUND. Students were introduced to this form of exercise by the multitalented Lesley Dempsey from ‘Fusion Elite’ in Carlow. Through the use of drumsticks and music, students are given a full body workout whilst also enjoying their favourite songs and making some noise in the process! Last week Green School members and some new eager Gardeners began to weed the flowerbeds and plant more bulbs in anticipation of spring. The courtyard will soon be blooming with colour. As part of Catholic Schools Week, students took part in a diversity challenge. 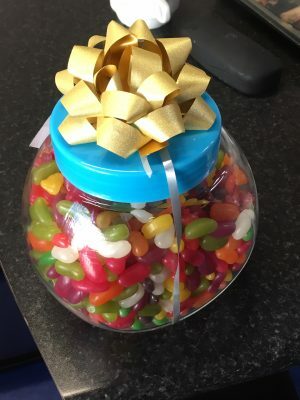 The challenge was simply to guess the amount of jellybeans in the jar. 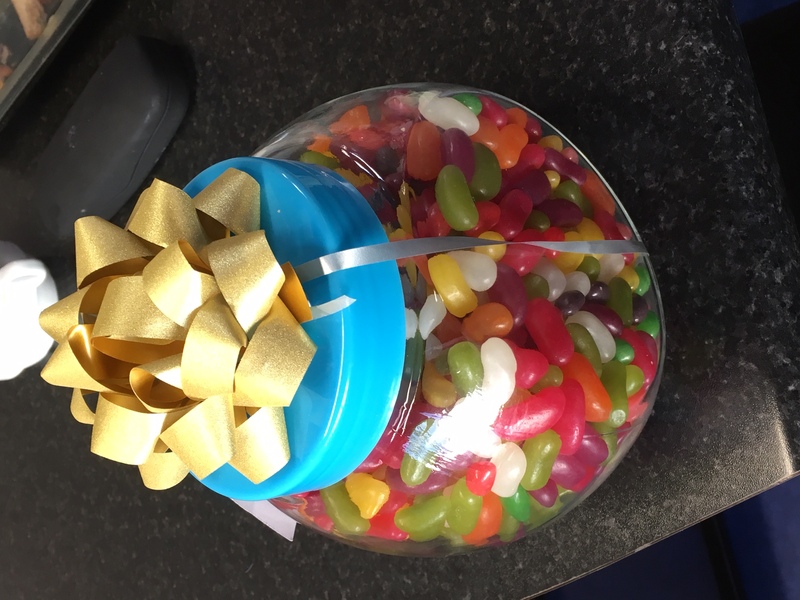 Congratulations to Mary Orbinski who had the closest guess to the 722 jellybeans in the jar! Each student was reminded to remember that beyond each jellybean’s exterior might be a surprising flavour that one did not expect. This reminds us to look beyond people’s exteriors and to value what is within all of us. Presentation College highlighted and celebrated the fact that our school community is diverse. We are proud to have students and staff with twenty-six different nationalities learning and working together in our school. On Wednesday, students enjoyed a “Sacrament Scavenger Hunt”. This focused on the meaning and symbols of the seven sacraments. Is it True? Is it Hurtful? Is it Illegal? Is it Necessary? Is it Kind? Students were reminded that: The Internet is written in Pen, not Pencil and to THINK BEFORE YOU POST. Another slogan was: Be Careful what you CLICK, It could be a TRICK. 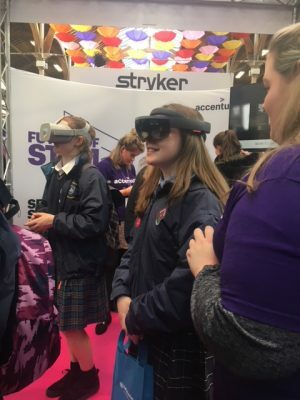 Futurewize, in partnership with Science Foundation Ireland, is a five-week STEM programme linking the strands of the Junior Cycle Science curriculum: Earth and Space, Chemical World, Physical World and Biological World, to varied careers and ﬁelds of study in STEM. With hands-on activities, students journey through Science, Technology, Engineering and Maths and uncover the future possibilities within Science. Thirty-two First Year Science students received certificates in Presentation College on completion the programme. 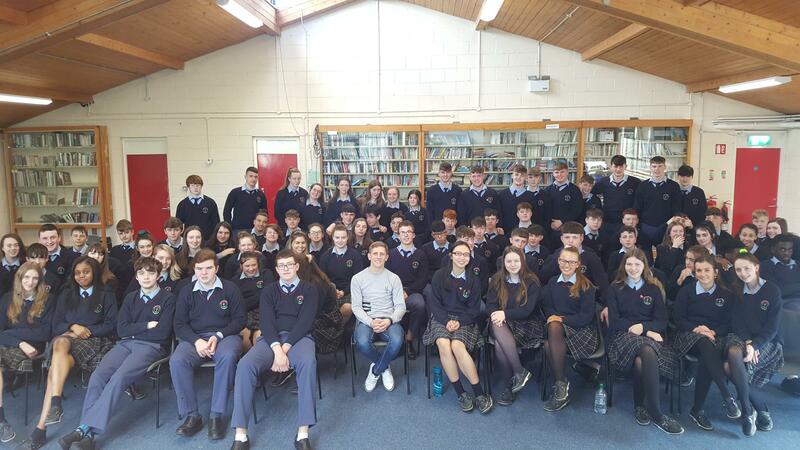 The five-week programme was delivered by Conor Byrne from Merck Sharp and Dohme with the help of Science teachers Mr. Homan and Ms.Kinsella. 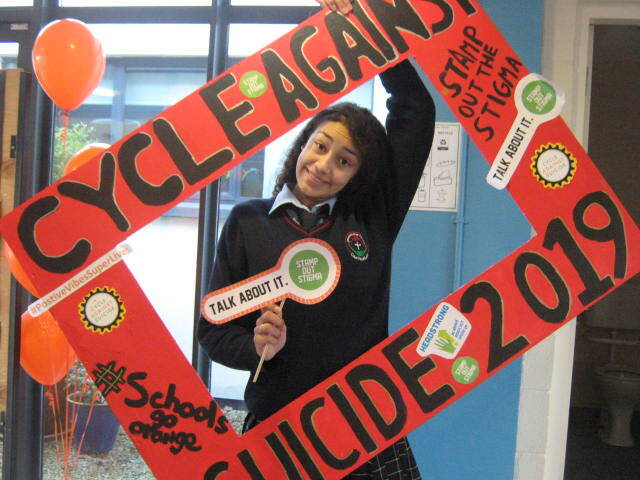 The programme was organised through Junior Achievement Ireland. Ms. Cumiskey, the Guidance Counsellor has established links with Junior Achievement Ireland over the last few years and recognises the importance and the impact of these programs on the students. Our very active Green School Committee were delighted that our school was selected by Carlow County Council for some very exciting workshops to be given by Eco-Unesco. We decided that rather than only committee members attending the workshops, that it would be better for full classes to avail of them. There were six possible workshops. These were: “Alternative Energy”, “Biodiversity and the Value of the Environment”, “Endangered Species”, “Food Waste and Water Security”, “The Sustainable Development Goals and Global Inequality” and “Zero Waste”. Last week students from enjoyed a very interesting and thought provoking workshop on “Food Waste and Water Security”. This links very well with “Water” which is the current theme we are working on as part of our Green School Programme. 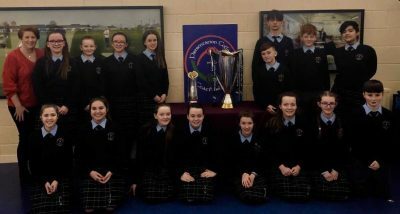 Presentation College were very fortunate to receive a visit from some of the silverware that Leinster Rugby have won over the last 12 months. 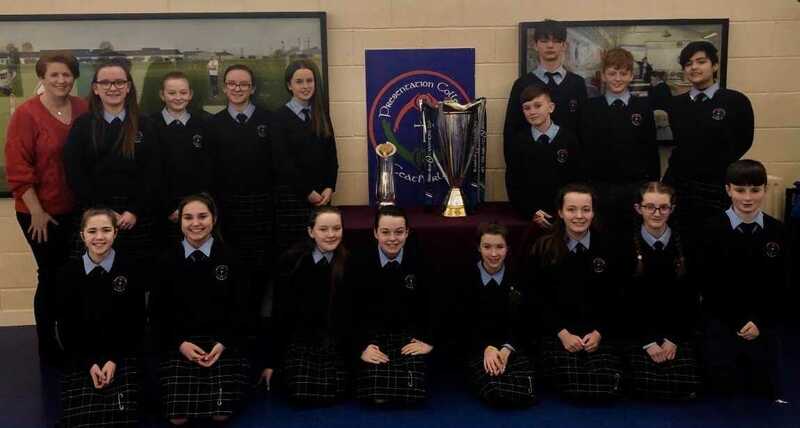 The champions Cup and The Pro 14 Trophy, were brought to the school by the locality’s CCRO Gearoid Dunbarr. 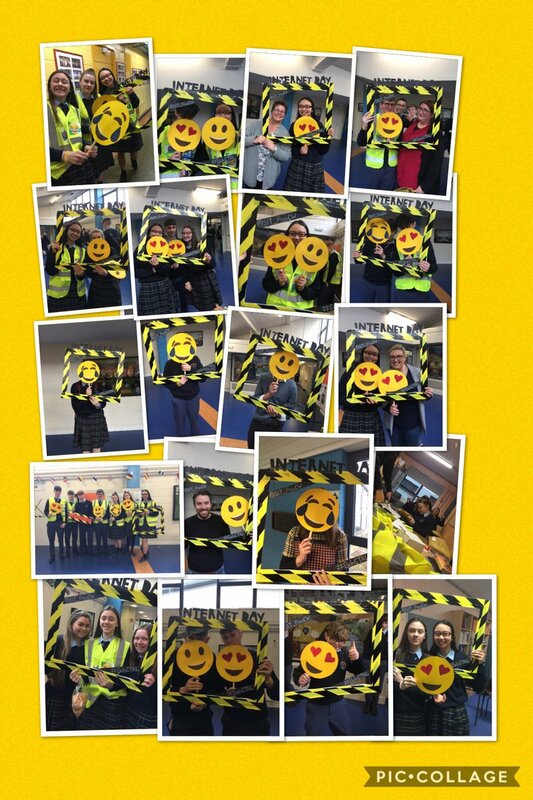 There was great excitement in the school as students got the opportunity to see, hold and take photos with the trophies during break time on Wednesday 6 February. 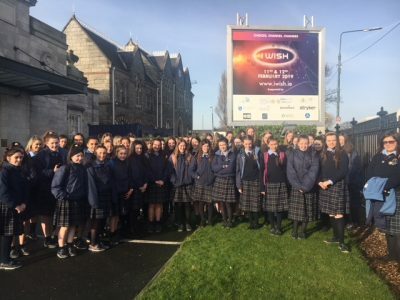 Recently fifty-two students from across First, Second, Transition Year and Fifth Year from Presentation College travelled to the RDS to take part in the I WISH conference. I WISH (Inspiring Women in Stem) is an initiative to inspire, encourage and motivate young female students to pursue careers in Science, Technology, Engineering and Mathematics (STEM). The focus of the conference was how STEM can change our world. The lack of female participation in STEM means we are not benefiting from fifty percent of the possible pool of talent. Changing this can solve the current skills gap in the industry. There are many world problems, the solutions to which lie in harnessing the power of girls who have skills and expertise in STEM. Examples of these world problems are: Food shortage, Climate change, Pollution and Ageing population. 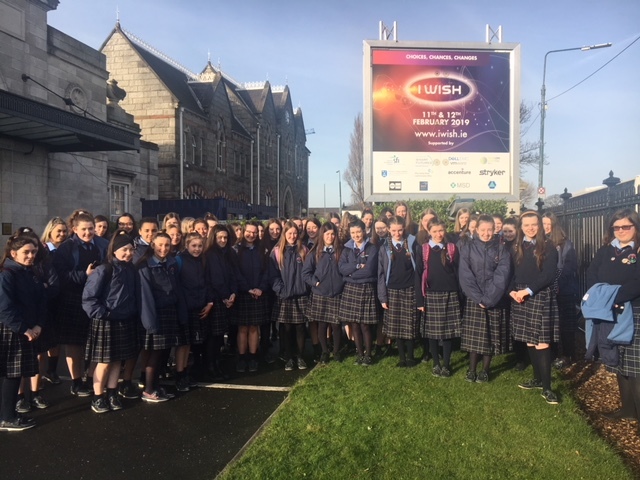 Harnessing the power of thousands of girls and encouraging them to pursue careers in the STEM area is the aim of the I WISH Conference. 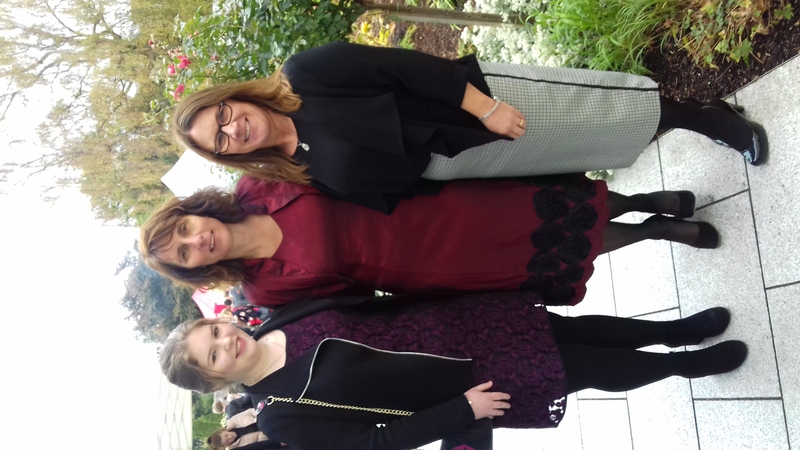 On the day we heard from a range of various speakers including Gillian Keating, Caroline O’Driscoll and Ruth Buckley (Co-Founders of I WISH), Paula Kirk (ARUP), Gillian Bell (Symantec), Jackie O’Dowd (Science Foundation Ireland) and Nkirika Uwaje (Dell EMC). Many students mentioned the latter as being a particular inspiration for having co-founded Osun, an independent Women’s Clothing Brand that looks to inspire the world of fashion with contemporary print & sustainable fashion. Following the range of speakers, all students had the opportunity to interact with a host of exhibitors from Deloitte, AIG, Chartered Accountants Ireland, Google, Aer Lingus, IBEC BioPharmachem, SISK, MSD, Johnson & Johnson, Zendesk, Stryker, Accenture and many more! 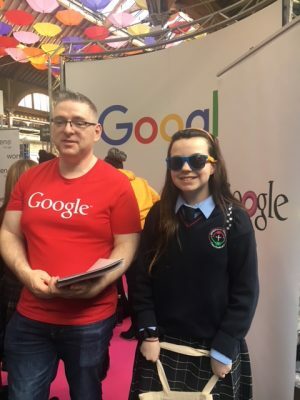 A fantastic experience to interact with and gain an insight into the possibilities open to students who pursue Science, Technology, Engineering and Maths. 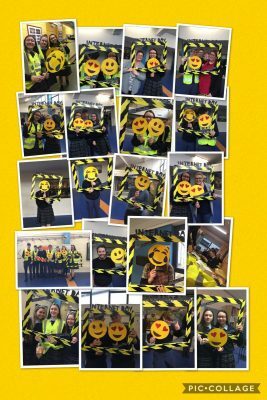 Many thanks to Ms. McHugh and Ms. Cumiskey for organising. 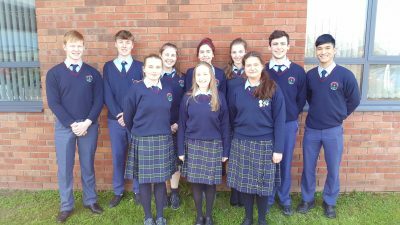 AILO is the acronym for The All Ireland Linguistics Olympiad. This is a problem solving competition, which uses obscure and unfamiliar languages. Participants rely on their logical and problem solving abilities. This year was the second year that students from Presentation College took part in the competition. Thirty-four students from First, Fourth, Fifth and Sixth Year competed in the First Round of this very prestigious competition. 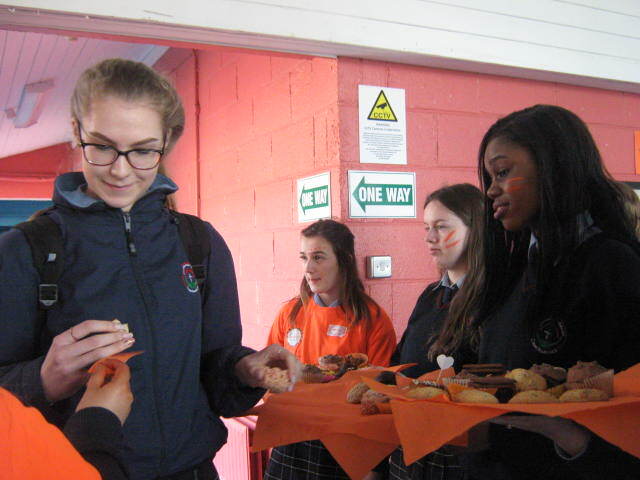 Ms. Byrne who teaches German promotes the competition and organises workshops and lunchtime training for interested students. 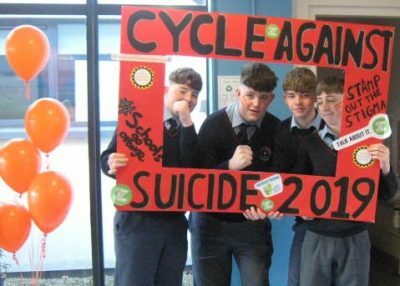 The aim is to find the top problem solvers in Ireland. Students attempt to solve language-based problems involving unusual languages. This year the languages were: Oscan, Pitjantjatjara, Slovene, Maltese and Ndebele. Students are not expected to be familiar with the languages. There are always five different languages in each competition. Participants are given clues and expected to use the information given to either translate or explain how the language works. We were delighted to find out that Julie Becherova was one of the top one hundred students from all over Ireland. This is Julie’s second year to enter the competition. Julie will compete in the Final in DCU in March. 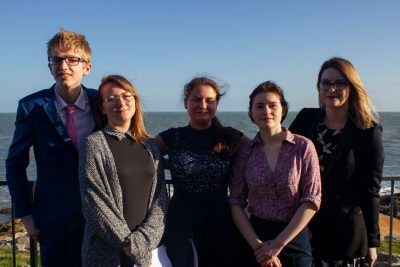 The top four students will then represent Ireland against the rest of the world in the International Linguistics Olympiad in South Korea this summer. We wish Julie all the best as she prepares for the Final. Last week our third parcel from the Anne Frank Realschule in Ahaus, Germany arrived. Eighty-eight students have a pen pal with whom they correspond through both German and English. 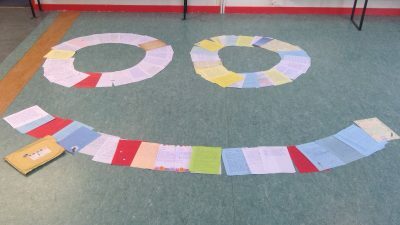 The German students also write in both languages with the theme of each letter decided in advance by the teachers involved. The first letters included an introduction in the foreign language and a timetable in the native language as well as a discussion of the favourite subjects and school. 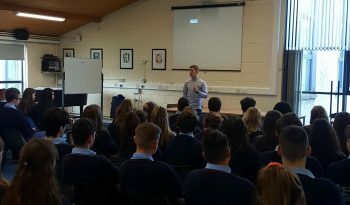 This proved very interesting and there are major differences between the school day in the two countries (the Irish working much longer hours and much harder!). The second letter included a Christmas card and information about food and the celebration of Christmas in the student’s family. The cards we received from our German pen pals were very interesting to read in our groups in class. Students learned a lot about the German culture and found that like here in Ireland, the Germans do not all celebrate Christmas the same way. To ensure that the Christmas cards arrived in time, the Germans wrote their cards explaining how they celebrate Christmas (in German) and posted them the same time that we posted our cards explaining how we celebrate Christmas (in English) and our letters in which we wrote more about our interests in German. Last week we received the reply to our letters. Students are getting to know their partners better, with topics like interests, hobbies and music being shared. In our next letter, we will be writing in German about our interests, school, food and also a section in English about how we celebrate St. Patrick’s Day and Easter. The project involves each student writing and receiving four letters and a Christmas card. There is always great anticipation and excitement when the letters are expected. Some of the students involved may even have the opportunity to meet their pen pals when they travel on the School Tour to Germany next December. Learning German through drama and theatre – a perfect combination. 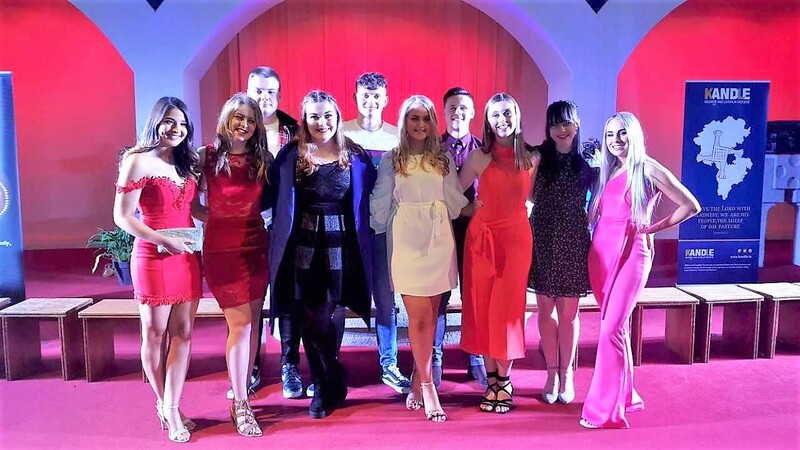 We have just found out that Presentation College has been selected to represent Ireland in a collaborative Theatre Poject, which will involve six countries and culminate in a week-long event in Berlin. We will be part of a group of thirty students, who will come from schools in Germany, Denmark, Finland, Scotland, Sweden and Ireland. One school in each country has been chosen by the Goethe Institute to participate. Last year the Goethe Institute ran a competition to select students for the bi-annual German Olympiad. 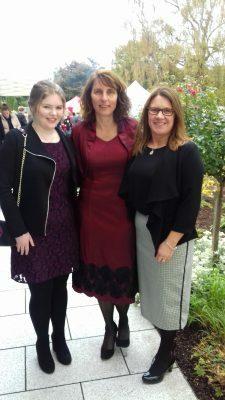 Two of the finalists were Presentation College students Meadhbh Broderick and Fiona Butler. 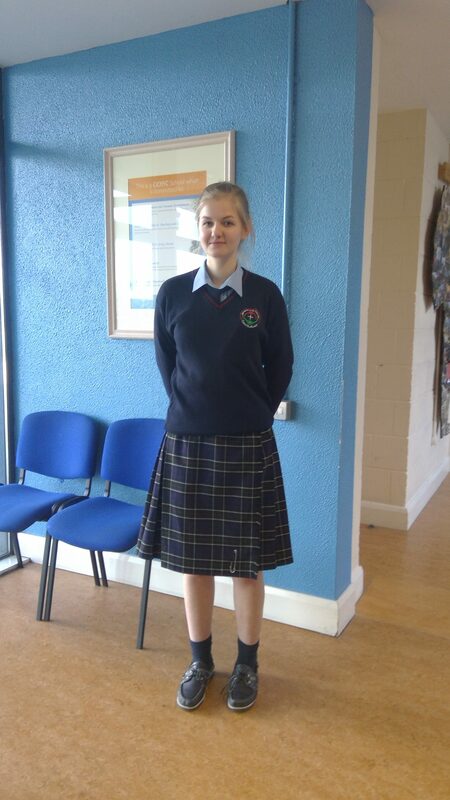 Meadhbh won the competition and represented Ireland in the International Olympiad in Freiburg last summer. 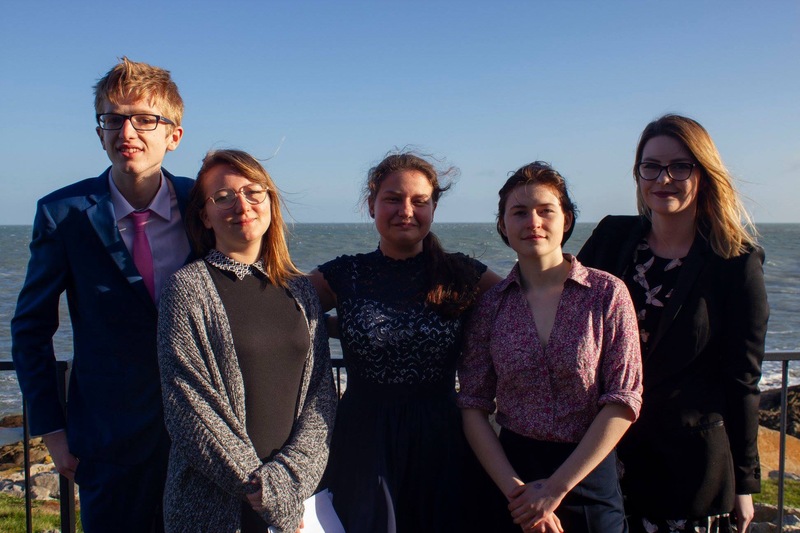 We are currently selecting the five students who will work on the collaborative project in advance of travelling to Berlin next November for a full week of Theatre through German. Congratulations to our newly elected Meitheal Team for 2019 – 2020. 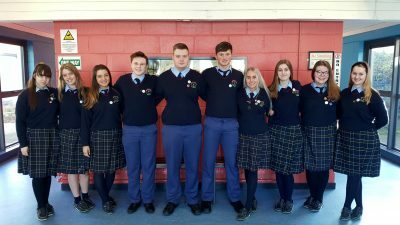 We wish Ellen Dempsey, Anna Fennell, Alexandra Fortune, Nikola Glowinska, Meghan Jennings, Corey Kelliher, Neung Kelly, Rachel Kelso, Rory O’ Flaherty and Charlie O’ Meara all the best in their new role throughout the new academic year. Well done to all the applicants, who represented themselves and the school extremely well. 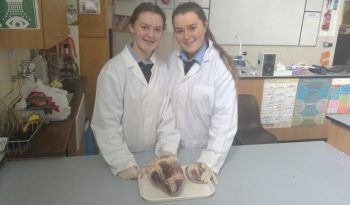 Sinéad Hayden and Áine Kelly compared and dissected cow and sheep hearts. Fifth Year students were happy to be dissecting hearts on St. Valentine’s Day. 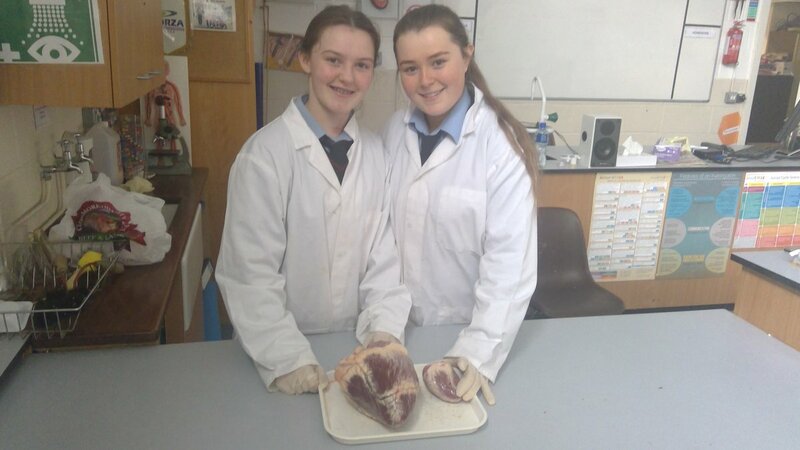 Sinéad Hayden and Áine Kelly compared and dissected cow and sheep hearts. Blessing – a Fifth Year student at Presentation College very successfully manages to juggle both sport and study. Following her recent success, we asked her to give an update on her soccer career. 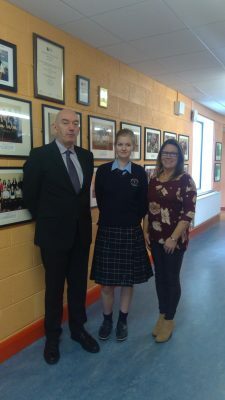 “I am a member of the Ireland Women’s U-17 squad who competed in the Euro Women’s U-17 Qualifiers from 17 – 29 October 2018. While there, we qualified to the elite phase, which will take place in Scotland late in March. Here we will compete against a difficult group containing Scotland, Germany and Norway. Recently we had a friendly match vs Iceland in Reykjavík, Iceland. We travelled during the mid-term (Friday 15 – Thursday 21 February). Unfortunately, we lost, but I managed to get my first International goal! The final result of the game was 5-2. I am currently in pre-season with Wexford Youths FC – both the Senior and the U-17 Teams. We are preparing for another successful campaign this season. Last season we (the senior team) won The Continental Tyres Cup, The Shield and The League! I am extremely excited to see what this year has in store for me!” We wish Blessing continued success in her academic and sporting career. Eric Donovan is an Irish boxer from Athy, County Kildare. His achievements include five Irish Elite titles and a bronze medal at the 2010 European Championships in Moscow, since turning professional he became the first boxer to win the BUI Celtic title inside five fights. 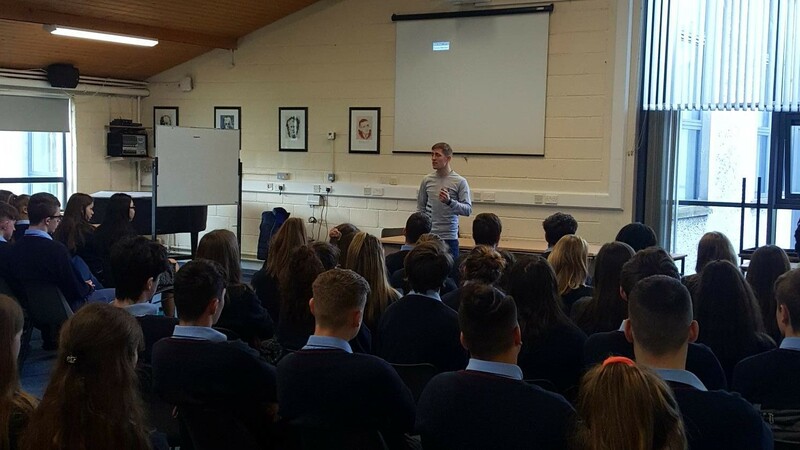 Last Thursday Transition Years were treated to a fantastic motivational speech by Eric Donavan. It was uplifting, honest and very inspiring. 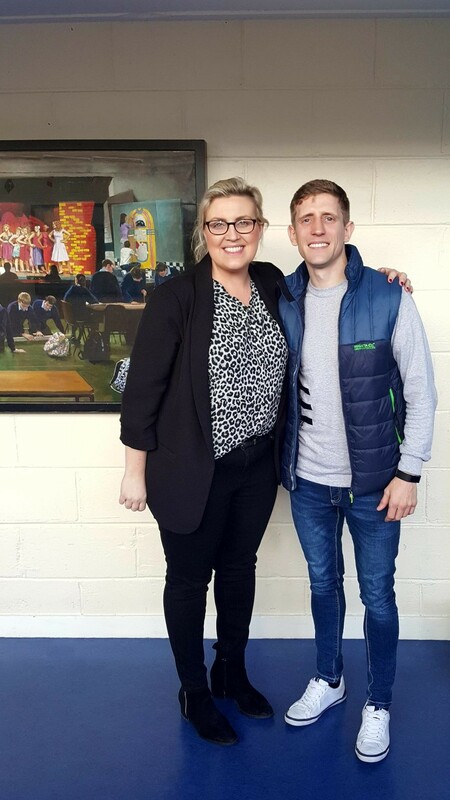 Thanks to Ms. Maher for organising the visit. We wish Eric well in both his personal and professional future life. Our incoming First Years were welcomed to the school last Friday afternoon for their Entrance Assessment. 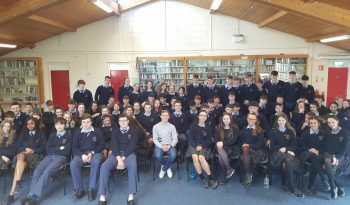 As well as meeting Mr. Murray the pupils met a fantastic group of students with whom they will become very familiar – the new Meitheal Team for 2019 – 2020 (see photograph). Our outgoing Team of Meitheal Leaders had their Awards Night and Graduation Ceremony on Friday evening in a packed Askea Church. Thanks to Ms. Doorley and Ms. Maher for mentoring, supporting and guiding the students throughout the year. Outgoing Meitheal Team: Meadhbh O’ Sullivan, Maisie Dolan Comerford, Caitlin O’ Sullivan, David Phelan, Jordan Hennessy, Sean Deay, Brooke Cassidy, Rebecca Minnock, Ciara O’ Doherty, Shannon Young. Meitheal Team for Our Incoming First Years 2019 – 2020: Back Row: Rory O’ Flaherty, Corey Kelliher, Alexandra Fortune, Rachel Kelso, Meghan Jennings, Charlie O’ Meara, Neung Kelly. Front Row: Anna Fennell, Ellen Dempsey, Nikola Glowinska.